If 2016 is marketed as the summer of nostalgia, one of the biggest summer hits to play on that popularity didn’t arrive on the big screen…it was on Netflix. Stranger Things, the 8 part horror series, is the definition of a sleeper hit for the on-demand service. Created by the relatively unknown Duffer Brothers, the nostalgic 80’s period detail, creepy-crawly horror story, and outstanding performances anchoring the narrative made the show a hit with critics and audiences alike. The outstanding cast has been highly praised across the board, from the show’s kid stars (including Millie Bobby Brown, Finn Wolfhard, Gaten Matarazzo, Calab McLaughlin) teenage performers (Cara Buono, Charlie Heaton, Shannon Purser, Joe Keery), and veteran adult actors including Matthew Modine and Winona Ryder. 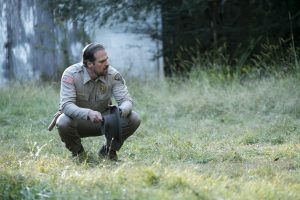 But one of the actors getting the most attention with the show’s success is veteran character actor David Harbour. While some viewers are just now learning his name, 42-year-old Harbour has been a familiar face on stage and screen for some time. A veteran of the New York stage, he’s appeared on Broadway six times, including a Tony nominated performance in the revival of Who’s Afraid of Virginia Woolf?. On screen, he’s provided memorable performances in intimate dramas such as Brokeback Mountain, Revolutionary Road, and State of Play; but is primarily known for a string of bad guy roles including roles in Quantum of Solace, The Green Hornet, The Walk Among the Tombstones, The Equalizer, and Black Mass. 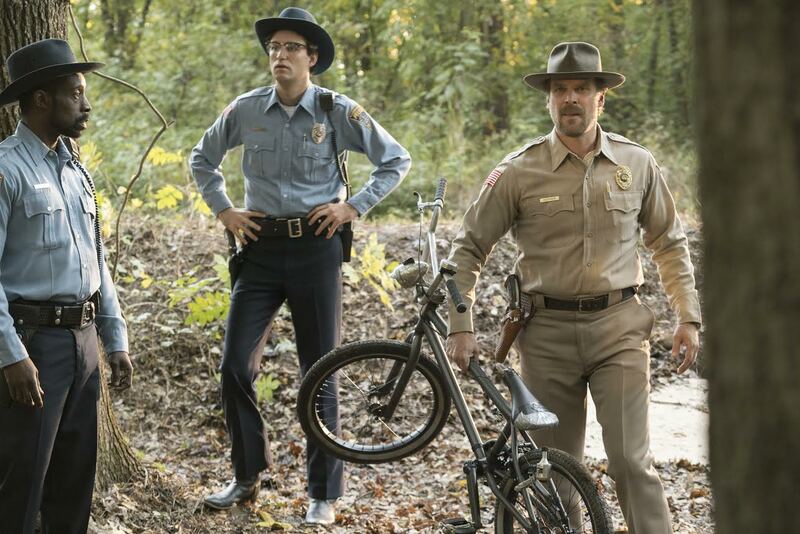 And on television he’s been a regular on five previous series (Pan Am, Newsroom, Rake, State of Affairs, and Manhattan) before finding his breakout hit by taking the lead as Chief of Police Jim Hopper in Stranger Things. This week, Harbour’s going from TV to movie screens opposite Viola Davis in Suicide Squad (Harbour’s also appeared in David Ayer’s End of Watch), as Dexter Tolliver. He came close to an acting hat trick this summer playing Achilles in the Public Theater’s production of Shakespeare’s Triolus and Cressida…but he had to drop out of the show last week when he snapped his Achilles tendon on stage and required surgery. Fortunately, that medically ordered time off frees him up to enjoy the success of Stranger Things and gives him time to discuss the show and role which he considers his favorite to date. *Spoiler Warning for Stranger Things. Interview has been edited for clarity. Congratulations on the show. It seemed as if within two days of the show being released it was all over social media. What’s the reaction to the show been like to experience from your perspective? I had no idea audiences were going to react the way they have and be so positive about the whole thing. I don’t have the numbers or anything, but it certainly feels like it’s a hit. But more importantly, it feels like a self-generating hit. It’s not like the show’s marketing had been shoved down people’s throats. People discovered it and talked about it, or tweeted about it, passing it along to their friends. And that’s really the most gratifying thing. It’s not that we had a huge hype campaign, people found it and wanted to keep watching. I’ve done a lot of work, and had various successes. I’ve done things which were critically praised or were popular with audiences and made some money. But I’ve never really been a part of something like this, which is critically acclaimed, but also found an audience that are just loving it. And I’ve never been a part of a show that I’ve been so proud of. On every level, this is exactly the kind of work I’ve always wanted to do. All you want to do as an actor is move people and I feel like we did. The response people are having, from those I’m hearing from, are how moved they are by it. The most gratifying part for me personally is hearing from people in different parts of the country, who I’m very different from, who are still touched by the same things that I was. I get tweets from people who say they want to live better lives after seeing Hopper or writing “my 12 year old daughter thinks you’re the coolest.” And it’s not necessarily my acting they’re talking about, it’s the character. I’ve never been a part of a hit like this and I think I’m old enough to be able to enjoy it. I can sit back and think, this is a really nice thing to be a part of, and I’m not taking myself too seriously. It’s interesting that you mention being a little older made this an even better experience. Is this a part that you feel you had to age into as an actor in order to play him? I can imagine playing him at 30, but being in my 40s now, there’s such a huge difference. And at 30, I didn’t realize there was a huge difference between 30 and 40, but now I do. People say life begins at 40, and I have to say I kind of agree with that. You get to a certain point when you realize you really don’t have that much time left, so you might as well be doing the things that make you happy. Had I played him at 30, I would have been more concerned about how others felt about him and wondering and asking how I should play him. But now I just do what I want to do. So that’s been very liberating. But you also just get more life experience. I just saw Anthony Hopkins in this movie, The Dresser, and seeing this guy with such rich life experience makes a difference. It’s so funny that in Hollywood there’s such a temptation to want everyone to be younger and prettier. But it would be nice to bring back the idea that we can grow into men and women who are still very appealing. I think life experience is very appealing and what I’m attracted to as a viewer. Life experience sometimes just breathes through an actor’s skin and shows in their eyes and on their faces, their whole beings. I’m very happy I got this part at 40 rather than at 30. You clearly seem to really have found a personal connection to Hopper that seems very unique and special as an actor. What initially drew you to him when you read the script? I sat down with my TV agent to discuss what I wanted to do next, after having been in a few series in the past few years. I’d gotten to a point in my career where I’d played a lot of bad guys or villains. And I’d always wanted to play what I call, the broken gladiator. I’d always wanted to have a leading role, but a very complex one. And when this show came around, the casting director reached out. Carmen Cuba is an amazing casting director, she’s worked with Steven Soderberg, and she thought of me first and sent it to my agent. And this was one of those script where after reading it I thought, they’ll never consider me for this part. It’s too good, the script’s too good and the part’s too good, they’ll want a star. I assumed every guy in Hollywood’s going to want this. But Carmen, to her credit, really wanted me. And The Duffer Brothers had seen me on this show I did called Manhattan, so they were interested. I made a tape and it was on. But what really drew me to Hopper was that it was a show about ordinary people who were making the choice to be heroic. They aren’t Agents of Shield or superheroes battling similar superpowers. Hopper’s an average guy. And I should add, it was really fun to get to eat donuts and have love handles and smoke cigarettes in character. I just wanted him to be a mess. There’s a temptation to let my narcissism take over and have him be the good-looking hero, but that would have been wrong for him. I understood that feeling of him being broken and a mess, life’s been difficult for me and I’ve struggled with the existential questions Hopper’s dealing with. I loved the fact that in the first episode, Hopper seems to hate children. He’s so mean to them when he first talks to the boys. It seems crazy to start a show like that. He smokes, drinks, takes pills, makes fun of everybody, and hates children. And the question is, how are you going to follow and learn to love this guy? And that’s what’s so satisfying about playing and watching him. You get to not like or believe in him at the beginning. Maybe he won’t save Will. 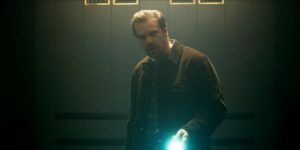 And as played by David Harbour, there’s a very good possibility that he won’t! It’s highly likely that as played by me, Hopper won’t do the right thing and get things done. But it was so satisfying to go on this journey with Hopper because hopefully if he can do something heroic, than anyone can make the heroic choice. We don’t have to be tremendously in shape or have powers to be heroic, we can all make heroic choices. I think that’s kind of beautiful. It’s interesting that he’s starts out hating kids, because the character’s literally introduced, before we even see him with his daughter’s drawing on the wall. And that drawing stays up when he’s searching the trailer like Gene Hackman in The Conversation and referenced when he sees Eleven’s room. And that says so much about his character. Who he was and who he’s become. And opening like that reminds the audience to always keep his history in the back of their mind and look for clues about that back story. His backstory’s handled so beautifully. Yeah and we came up with some of those hidden elements together, The Duffer Brothers and I. Originally they were going to have a photograph of the family, but then we decided a drawing would work better. It would feel obscure and interesting, and then it could directly relate to Eleven’s drawing. There’s actually a little Easter egg that’s in that scene we came up with. The blue bracelet on my right wrist is actually one of my daughter’s hair ribbons, which she wears in the flashback that he took after her hair fell out. And in the first scene, when he wakes up, he touches it. It’s the first thing he touches every day just to make sure to always remember her. So there are these little moments throughout, but The Duffers did such a great job keeping them so subtle that if you aren’t looking for them, you’ll miss them the first time you’re watching. Did you and The Duffers talk about how to address grief as a major part of Hopper’s character, and how it affected his evolution? How it affected his interplay with Joyce and Eleven? It’s funny you mention that drive to save Will above everything, because the one thing people are having trouble understanding and debating about is the decision Hopper made to give up Eleven’s location. I can see some of that guilt playing into his ability to reason with right and wrong, good and bad in those scenes. Did you have any trouble rationalizing Hopper’s decision? No, with him, the end always seems to justify the means. He went into that situation with his primary directive being to find Will. So he can’t be sidetracked by the idea of selling out this little girl. I also think that he has an understanding of the badass nature of Eleven and makes the assumption that she can handle herself with those lab guys. But I don’t want audiences to forget that as much as people fell in love with Hopper, he’s still the guy they met in that first episode. The guy who will let people down sometimes. If we get to go back for season 2, the question we’ll have now is, can audiences trust Hopper? Hopefully he can go back to the Han Solo status he earned, but he’s always Lando Carlrissian. He makes hard choices which are morally ambiguous. Speaking of moral ambiguity, I just saw Suicide Squad, and considering the authoritative role you play in it, I had in the back of my mind “I wonder if he’s going to turn out to be corrupt?” And I think I thought that was possible while watching Stranger Things the first time I watched the series. That’s just because of how many times I’ve seen you play morally ambiguous or corrupt law enforcement characters, you keep me on edge. We always hear about the bad guys being more fun to play, but having had the chance to play both sides, which do you prefer? I was totally ready to step into the good guy role. But, it’s good training to play bad guys because if you’re always cast as the good guys, they can become a little thin. If they always make the noble decisions, there’s no hesitation about what they’ll do. That moment of hesitation for the character, the fact they know they’re facing more than one option, is important. The struggle is what makes characters interesting. This is the opposite example, but Jonathan Demme talked about casting Hopkins as Hannibal Lecter. And what inspired that casting was when he saw him play this good, noble doctor in a movie. Demme was interested in the idea of Hopkins playing a differing kind of doctor, but still having that same doctor quality in both roles. I’ve played a lot of cops on-screen, Hop just happens to be one of the good guys. A lot of the villains I’ve played have been broken men, like Hopper, who just choose the dark side. But Hopper still has that messed up side that maybe I bring to a lot of roles. He just chooses to make better decisions. But playing all those villains provided excellent training. You do a lot of your scenes with Winona Ryder, who I think has never been better than she is as Joyce. And the two of you are great together on-screen and clearly had great chemistry. Did you work together to build that relationship between the characters? It was pretty natural. I of course had a huge crush on her in high school when she was a big movie star in all those movies. I loved her in Heathers and movies like that, so I probably came in with a certain bias. But the first time we met was after we’d both been cast independently and went out to dinner with the Duffers. And I think we talked for about 5 hours that night. We really broke down the characters, so when we got to the set, we didn’t need to talk that much about connecting in the scenes. She’s so willing to get into it with people and go there on-screen. She’s not precious about her acting at all. She doesn’t act like a big movie star or diva, she’s completely willing to get in there and do the job. And she goes there emotionally too. She was willing to get into fights with me, just like real friends. And I think that really comes across on-screen. People talk about it not being professional to get emotional on set, but we were. I’d get pissy with her and then she’d get mad at me, and then we’d make-up. Just like Joyce and Hopper need each other, David and Winona needed each other on set throughout this process. When the part has a personal connection and you have to deal with some really heavy emotions on-screen, is it harder to get through the filming experience? Did you start to feel like you were kind of tormenting yourself by going through the journey with Hopper? Yeah, it was a hard shoot for me. We were down in Atlanta and I didn’t know anyone so I got pretty lonely. But I also found that characters work on me subconsciously and I’ve kind of stopped fighting it. It’s funny that we’ve talked about the age thing, because as a younger actor, I would fight that emotional connection and try to tell myself “it’s just the work.” But now I see the impact the characters I play have on me and I just accept and use it. But because of how damaged and guilt-ridden Hopper is, I found it working on my psyche and I was kind of miserable. But I was lucky because by the time episode four rolls around, he starts to galvanize and gets into action. You know, he starts punching people. So that was liberating and it got me out of the house. I started doing more stuff and reading again. But it’s a tricky thing because I’m so proud of the show, and we were all so right for our roles. I think the acting’s just impeccable. But part of that’s because we were sort of living that story out in Atlanta. I know Winona was going a little stir crazy in her apartment in Atlanta. And the teenagers were acting out. But the experience I had to live out was playing a character who feels very alone, so I sort of cut myself off from people. But looking at the finished product I feel like that was so worth it. It’s such a gift to have gone through that experience and I have something so beautiful to show for it. That fourth episode is the big turning point for the character. As soon as you tell Winona about how you dealt with the grief and say you had to pack away your feelings about your daughter’s death so you didn’t fall down the rabbit hole of grief, you really start acting out. Clearly packing it away did not work because all that grief and anger starts to come out with fists of fury right after. Exactly! What’s so fun is, I think initially it’s less about Will and more about the fact that he’s been lied to that makes him so mad and act out. Things aren’t making sense and people are lying to him. And that sort of galvanized him and he just loses it. He starts punching people and going rogue. It was a very satisfying episode in that way. He gets to just spring into action very quickly. And then episode five has an interesting turn, when he goes back to Joyce and says he’ll follow her lead because she was right about everything. I know you just left the Shakespeare in the Park production due to injury. Are you working or preparing to work on anything during your recovery? I just had surgery on my heel so I can’t really work for about 5 weeks. But if we get a season 2 I hope we’ll start filming soon. I’m actually really happy to be forced to have the rest because I’d been going pretty hard for a long time, so it’s nice to sit back and relax. Right now I’m just sitting around reading Stranger Things fan fiction. That’s become a new favorite pastime.